Andrew Beatty writes in his story of encroaching Islamist orthodoxy A Shadow Falls in the Heart of Java. The island of Java is Islam's eastern frontier, and it looks across the Pacific towards the west coast of America. Although Indonesia is the world's most populous Muslim-majority nation its religion is syncretic and draws on diverse traditions. This attracted American composer Lou Harrison and he developed a syncretic composition style that combines western instruments with the Javanese gamelan. 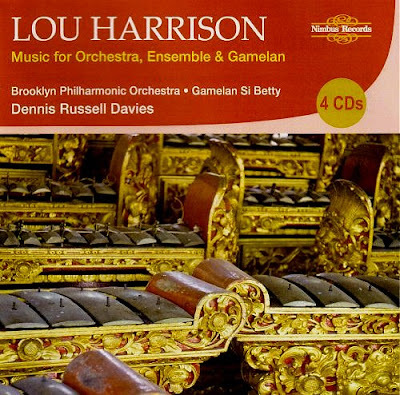 My header image shows the recently re-released 4 CD Nimbus box of Lou Harrison's music for orchestra, ensemble and gamelan. The recordings were originally issued on the MusicMasters label in the 1980s and 1990s and feature many leading exponents of Lou Harrison's music with a guest appearance by the composer himself and Virgil Thomson as narrators in the Suite from the 'Marriage at the Eiffel Tower'. Lengthy advocacy is unnecessary. Instead I will say just two things. The first is that the set is currently retailing on Amazon.co.uk for £17.99 and the second is buy it. Lou Harrison followed Colin McPhee's lead in his exploration of the music and culture of Java. Read more in Colin McPhee - East collides with West. Thanks for this tip. And for your earlier post with the interview with Lou Harrison. I will order the CD from amazon. I am interested in the early Indonesian influence on European (Dutch) culture. I have just written on my blog about the introduction of batik into western art: http://www.pauldoolan.com/2011/02/johan-thorn-prikker-and-introduction-of.html. My previous post was on the Javanese roots of the Dutch artist Jan Toorop and the post previous to that was about the dicovery of Bali by Westeners. I hope you'll take the time to read these. Thanks for adding the musical angle.